Today’s Larford Pairs saw 19 pairs (38 Anglers) fish. Conditions were very warm, small breeze and heavy showers. Winner on the day individually was Zac Brown (Preston) who drew Peg 28 on the Match Lake. Zac caught well all day with banded pellet on the pole and later found big carp feeding down his edge. 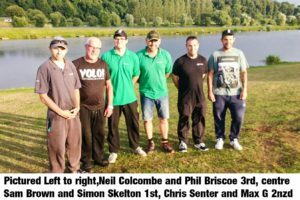 2nd on the day was Neil Colcombe (Larford) who drew peg 44 on the Match Lake.